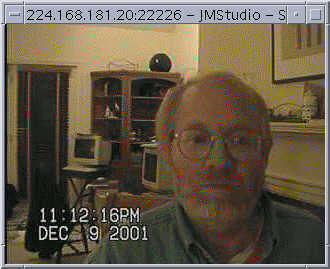 Picture of Moulton in his computer study at home (from the early 90s). Barry Kort is a founding Director of MicroMuse, the first Multi-User Simulation Environment (MUSE) site fully dedicated to educational purposes. Dr. Kort received a BSEE with High Distinction from the University of Nebraska, and joined AT&T Bell Laboratories in 1968 as a Member of Technical Staff in the Network Planning Division. Under Bell's Graduate Study Program, he earned his Masters and Ph. D. in Electrical Engineering at Stanford University. 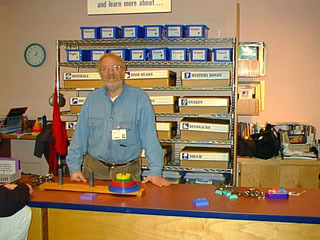 As a Consulting Scientist in the 90s at BBN in Cambridge, MA, Dr. Kort developed systems and concepts for network-mediated education and for informal science education, including the use of computer animations and virtual communities. He also volunteers at the Museum of Science in Boston. See the Puzzle Background and Puzzle Links pages. On MicroMuse, Dr. Kort has adopted the persona of 'Moulton', the proprietor of the MicroMuse Science Center, where he can be found collaborating with young people and adults who share his interest in puzzles, creative problem solving, invention, and informal science education. Obsolete and retired computer equipment from the historic MuseNet Project is available for free, to anyone who cares to come to Bedford MA (a suburb of Boston) to pick it up. In the wake of Littleton, Moulton and Moonbeam have jointly posted their recent research into Thinking About Violence in Our Schools. Bill Mason, then a student at UC Riverside, retaliated with a wicked sendup, Thinking About Stupidity In Our Scholars. Read Moulton's Articles on EdNet for his personal memoirs of the MicroMuse Project. The Educational Technology Report you've all been waiting for -- in his monumental work, Bring a Candle, Not a Sparkler, Moulton summarizes the findings of 10 years of unfunded research in Educational Technology. Read Moulton's Computer Dialogues for a glimpse at the future of Artificial Intelligence. Many of the ideas presented informally in the above pair of references are now finding their way into scholarly research at MIT's Media Lab. See the MIT Affective Computing Home Page, The NSF-funded Affective Learning Companion Project at the MIT Media Lab, and Moulton's local pages on the Theory of Emotions and Learning. The newest summary of this work can be found in the archives of the IEEE Education Society. See also The Musings of Montana Mouse. If you like that, see Moulton's Utnebury Pages for more musings. Moulton's new Blog is called Moulton Lava. Moulton's Father passed away in 1997 at age 84. Here are the many warm messages from friends during the vigil of his final days and upon his passing. This Obituary appeared in the April 22nd edition of the Indianapolis Star. Graveside Services were held on April 24th, lead by Rabbi Eric Bram. The Eulogy was delivered by Rabbi Geoffrey Dennis. Moulton lives in a Condominium located along the flowage of the Shawsheen River in Bedford Massachussets. The land alongside the river include Wetlands and Conservation Lands owned by the Town of Bedford and protected by the Bedford Conservation ByLaws and by the Wetlands Protection Act. Some Unit Owners decided to build a golf course on this land, and did so without notification to the Town, without approval from the Planning Board and Conservation Commission, and without approval of the remaining Unit Owners. The Trustees of Bedfordshire then assumed the cost of maintaining the golf course and rolled the expenses into the annual budget. Moulton protested the invasion and conversion of the Wetlands and Conservation Lands for the construction of an unapproved golf course, and refused to pay for it. The Trustees then filed a lawsuit in Superior Court, seeking an order to sell Moulton's condo. Moulton counter-sued the Trustees, alleging willful breach of trust and exceeding their lawful authority. You can read the pleadings and outcome of the case and send messages of support to Moulton. I regret to report that Moulton lost the case. The Boston Globe carried a feature article on the case on Easter Sunday, 1997. Here is the first installment of a comic opera about Bedfordshire -- Ya Got Trouble. Please visit the Plowshares links in which I chronicle my relationship with Phil Berrigan, Steve Kelly, Steve Baggarly, and others who witness for the dismantling of our weapons of mass destruction. MIT Industrial Liaison Program - Networks and Learning by Barry Kort, AI Magazine, November 1990. MicroMUSE Case Study by Jason Jay, Harvard University, January 12, 2003. IEEE Education Society archive on Cognition, Affect, and Learning.